11 am HST Update: The Central Pacific Hurricane Center in Honolulu reports that aircraft reconnaissance data indicate a slight weakening of maximum winds to 85 mph. Movement is still westward at 15 mph from a position 845 miles east of Hilo or 1025 miles east of Honolulu. A Tropical Storm Watch could be required for portions of Hawaii later today or tonight. After weakening to Category 2 on Friday, Hurricane Felicia has continued weakening to Category 1 by Saturday morning. At 8 am PDT, the storm had maximum winds of 90 mph as it moved westward at 15 mph from a position 930 miles east of Hilo, Hawaii. The current track is expected to continue for the next several days along with gradual weakening. ACROSS THE STATE THROUGH TUESDAY. The Honolulu Advertiser and Star-Bulletin report that sales of emergency supplies have been brisk across the state, and government officials are preparing plans to deal with possible storm impacts. 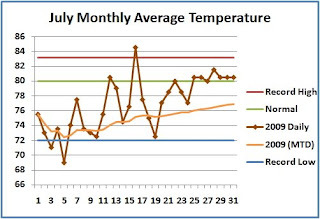 The National Climatic Data Center's (NCDC) preliminary analysis for July, posted this afternoon, indicates that the past month was the 27th coolest out of 115 years of record in the U.S. The national average temperature of 73.5°F was 0.8°F below the 20th century average. For the year to date (January through July), on the other hand, the average was the 28th warmest. The cool temperatures were particularly acute in the Midwest and Ohio Valley, where 6 states had their coolest July on record: Iowa, Illinois, Indiana, Ohio, Pennsylvania, and West Virginia. In addition, several adjoining states had their second coolest July: Wisconsin, Michigan, Missouri, and Kentucky. Temperatures were above normal from Florida westward across the Southwest, California, and the Pacific Northwest. Arizona had its third warmest July, and temperatures were also much above normal in New Mexico and Washington. NCDC reports that "Death Valley, California set its all-time monthly average maximum temperature of 121.3°F. Twenty-two days in Death Valley reached 120°F or higher which beat the old record of 19 days." The temperature pattern of cold in the Midwest and Northeast and warm in the West was the result of a persistent, abnormally strong, circulation pattern in the middle levels of the atmosphere which had a low pressure trough centered near the Great Lakes and a high pressure ridge along the Pacific Coast. "The U.S. had not seen a single record cold state, in any month, since August 2004 and there had not been six or more record cold states in a month since July 1992, when there were nine." 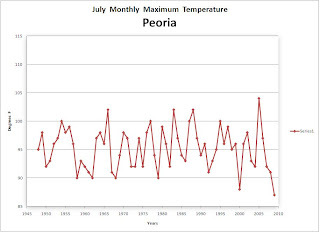 "More than 400 record low minimum temperatures and 1,300 record low maximum temperatures (lowest high temperature) were set during July across the nine-state area that makes up the Central region." 8 pm PDT Update: Felicia remains at 135 mph at 8 pm. Movement is toward the west-northwest at 12 mph. 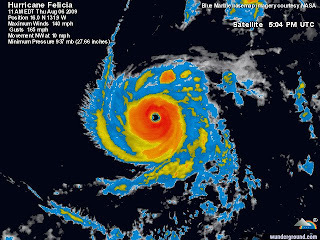 PM Update: As of 2 pm PDT, Felicia has weakened slightly to 135 mph. The storm is moving northwest at 10 mph from a position a little under 1500 miles east of Hilo, Hawaii. The latest advisory calls for the storm to begin weakening later today. As weakening continues in the next several days, it is forecast to approach Hawaii as a weak tropical storm or tropical depression. The current wind speed outlook calls for a 5-10% chance of tropical storm force winds reaching the Big Island within the next 5 days. CNN quotes Richard Knabb, deputy director of the Central Pacific Hurricane Center: "If anything, it will be a rain-making system over the (Hawaiian) islands." The intensity of the hurricane season is measured using the Accumulated Cyclone Energy (ACE), which is a combination of the duration and intensity of storms, rather than simply the number of storms. The downward revision in the forecast is based mainly on the continued development of El Niño conditions in the tropical Pacific. The higher wind shear (increase of wind with height) from El Niño is expected to outweigh the effects of warmer than average Atlantic and Caribbean sea surface temperatures. Despite the indications of lower than average tropical activity, NOAA cautions residents of the Atlantic and Gulf Coasts that they should be prepared every year, regardless of the overall level of activity. To paraphrase on old mariners' saying, "One nasty hurricane can spoil your whole day." 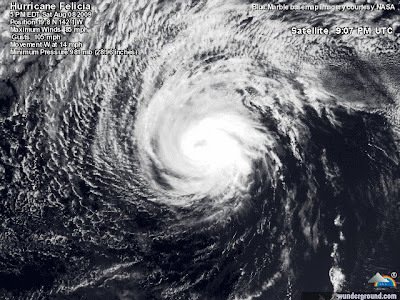 Some examples of hurricane landfalls in El Niño years include Betsy (1965), Bob (1991), Danny (1997), and Lili (2002). The most notorious example of a disastrous storm during a below-average season was Andrew (1992). Others include Hurricane Donna (1960) and Hurricane Betsy (1965). After starting the month in near record cool territory, Washington, DC ended July with an average temperature only 2.3° below the long term average. This was the coolest since the back-to-back cool years of 2000 and 2001. The month is tied for 44th coolest July since official records began in 1871. After the coolest day on July 5, with a high of only 73° and an average of 9° below normal, temperatures rose steadily during the month. The 90° level was first reached on July 12, and there were 7 90°+ days in all, including the month's high of 96°. This was just half of the long-term average of 13.8 days in July, but the high was only a little short of the average monthly high of 96.8°. Despite the deficiency of precipitation, there were 0 clear days and 24 partly cloudy, compared with the average of 7 and 12, respectively. 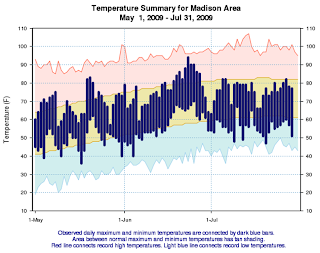 The average temperature at Truax Field in Madison for July 2009 was a record 65.7 degrees or 5.9 degrees below normal. The previous record was 66.7 degrees in 1891. Records go back to 1869. It was also a dry month with 1.94" of rainfall. This makes July 2009 the 7th driest on record for Madison. The driest July was in 1909 when only 0.29" of rain fell. 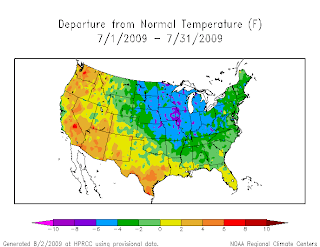 The average temperature at Mitchell Field in Milwaukee for July 2009 was 68.6 degrees or 3.5 degrees below normal. This is not cool enough to be in the top 10 coolest on record. However, it was dry and the 0.71" of rain that fell during July 2009 at Mitchell was the 4th driest on record. The driest July was in 1936 when only 0.28" of rain fell. See here for other posts on Polar Climate. The National Snow and Ice Data Center (NSIDC) reported yesterday that the average rate of Arctic ice melt in July was nearly equal to that in the record-breaking year of 2007. Total ice extent for the month was the third lowest for the satellite record in July, following behind 2007 and 2006. 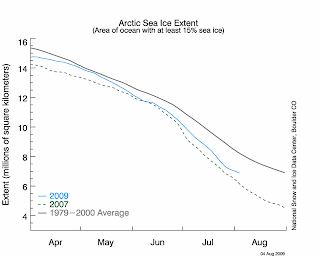 Sea ice extent averaged over the month of July 2009 was 8.81 million square kilometers (3.40 million square miles). This was 680,000 square kilometers (263,000 square miles) above the record low that occurred in July 2007, 250,000 square kilometers (97,000 square miles) below July 2008, and 1.29 million square kilometers (498,000 square miles) below the 1979 to 2000 average. Sea ice extent is unusually low in the Kara Sea, Baffin Bay, and along the Russian coast. The only area with significant above-average ice extent is southern Hudson Bay. THEY DID EXPERIENCE THE HOTTEST TWO FULL CALENDAR DAYS ON RECORD. THE HOTTEST 3-DAY PERIOD IN PORTLAND HISTORY...DATING BACK TO 1926.